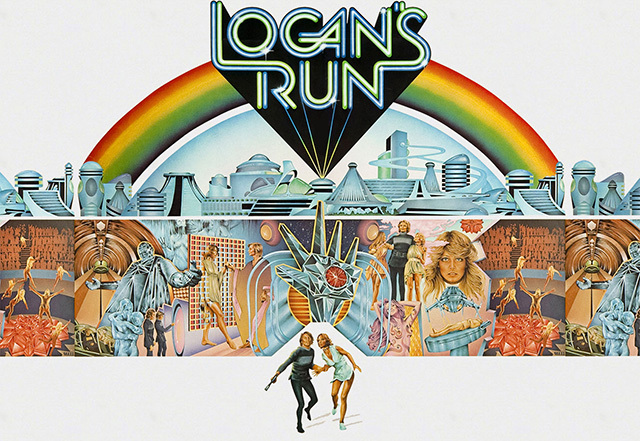 Game designers Gabe Smedresman and Catherine Herdlick of The Multiverse Council will be hosting “Logan’s Run,” a street game in San Francisco based on the classic 1976 sci-fi film Logan’s Run. The event is scheduled to run from 6:30 – 10 PM at a meeting spot (to be announced) in SoMa. Participants will be able choose, based on the ticket that they purchase, whether they want to be either a fugitive Runner or one of the Sandmen assigned to pursue them. Runners will be tasked with trying to find Sanctuary while keeping a good distance from the Sandmen. They recommend that runners wear “something fetching, shiny, and solid-colored in orange, watermelon red, red, mint, green, or emerald.” Sandmen can simply “wear black and gray.” You can purchase tickets on the official website and RSVP for the event online via Facebook. When your lifeclock turns black, will you accede to the mandatory euthanization ritual of Carrousel, or will you run? Search the corners and nooks of the City for the secret of Sanctuary. Discover strange sights and hidden peoples, some trustworthy – some not – all while evading ruthless squads of Sandmen searching for Runners at every turn. This is a street game in the style of Journey To The End of The Night. There will be 1-2 miles of walking involved: so wear comfortable shoes. There may be brief periods of running and chasing, but players of all levels of athletic ability will enjoy themselves.